These pens are some of the best. I love the way it fits and feels while writing. I strongly recommend. 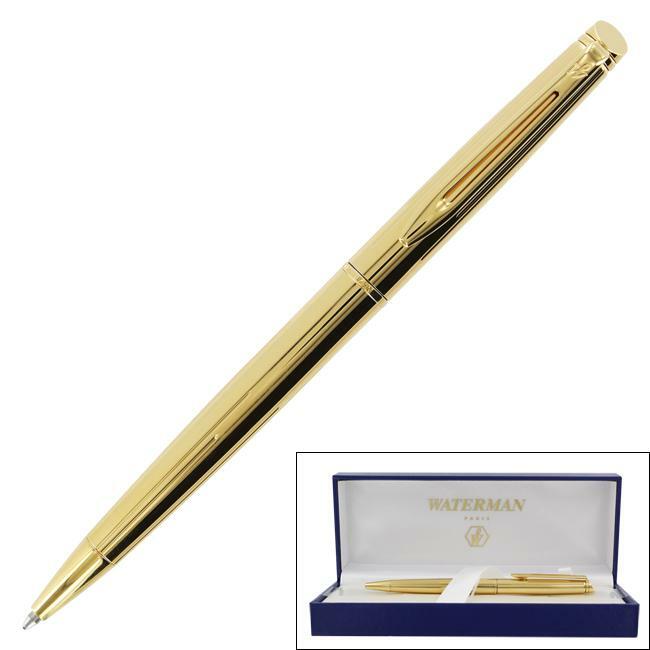 This attractive gold-trim Waterman ballpoint pen has a sophisticated look that makes it suitable for gift-giving for graduations, promotions, and more. The retractable fine writing pens have chiseled barrels that are comfortable to hold, and they have a medium point size and write in black ink. A storage box is included for convenience. "Is the finish on this pen match the waterman gold dust pens?" The Waterman Hemisphere Chiseled Gold GT Ballpoint Pen has a different finish than the Stardust Pens. The Chiseled Gold is more of a smoother, with a more shiny finish. Where the stardust is more of a duller finish.